Now that the masking is dry, I can add big sloppy, wet washes to my painting and keep those delicate areas white. 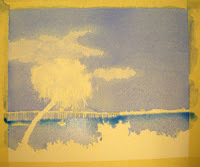 I did use some water over the bulk of the tree to create soft edges when I apply the washes for the sky. I used French Ultramarine Blue, and a touch of Ultramarine Violet for the sky wash. I applied the paint very wet. Once I was happy with the color and value of the sky, I used a paper towel to gently lift some little clouds. This must be done while the wash is still very wet. I crumbled the paper towel to create oval and round shapes for lifting. The harder I press the more pigment was lifted. Then, I wrapped a little bit of toweling around my finger and gently touched the edges of the clouds to create uneven edges around the outer areas of the clouds. Some blue remained inside the clouds and I will use those areas later to create subtle shadows in the forms. 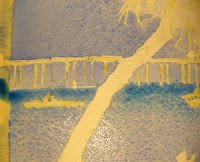 Next, I used French Ultramarine Blue and Antwerp Blue to add the first glaze or wash to the water area. In order to make the water look like it is receding into the background, and that it is relatively flat, the value (lightness and darkness) must be varied from front to back. Allow to dry or dry with a hair dryer. If you would like to follow along with this lesson, please visit my etsy shop and purchase the reference materials by clicking on the Online Class icon. The cost for the drawing and reference photo is only $5.00. Click here for my etsy shop: http://watercolorgirl.etsy.com.